If you’re tired of your usual morning joe, brew a cup of curiosity and become an international coffee connoisseur. All you need to do is understand coffee bean basics, and in no time at all you’ll wonder why you’ve been settling for ordinary coffee when there are so many extraordinary choices. Through experimentation you’ll learn about bean variety, importance of harvest altitude, bean size, wet or dry processing, freshness and type of roast. There are two main, superior coffee bean types. •Arabica bean: This richly flavored, specialty bean is grown organically and is picked by hand. Specialty coffee is always more expensive because it isn’t mass produced. 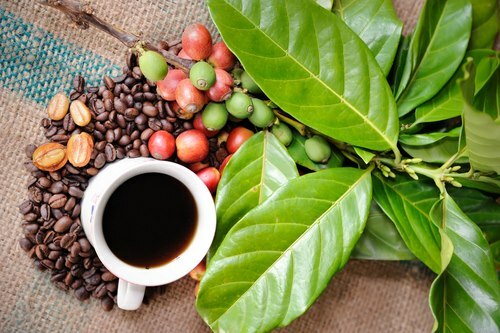 •Robusta bean:Used as a blend with other specialty beans because the flavor isn’t as rich. Every coffee aficionado knows that the most important step when making coffee at home is the grinding process. The secret is to know how long to grind the beans depending upon the type of coffee and how you wish to use it. For example, a finely ground coffee is needed to make espresso while a medium ground bean is used for drip coffee makers. Measure carefully because you should immediately brew whatever you grind. Coffee connoisseurs often turn brewing into a science. Brewing is the most challenging step in making the perfect cup of coffee. You’ll soon learn that the oilier the bean, the more flavor it releases. •Always keep your equipment clean after each use to prevent old smells from creeping into your fresh brew. •The perfect temperature to brew coffee is 200 degrees. Connoisseurs are very particular about the brewing water not being too hot or too cold. You can’t develop the perfect cup of coffee without investing in one or two barista tools. •Dosing tool: This handy tool allows you to make precise measurements and prevent waste. It can also be used to flatten your ground coffee before placing into your machine. •Stainless steel milk jug and thermometer: Most coffee connoisseurs believe that no cup can achieve greatness without the perfect foam on top. Using these items correctly guarantees the perfect temperature to make your foam. You’ve heard of wine tastings where people learn to expand their palates and learn about new wines. Coffee tastings, known to connoisseurs as “cuppings,” are also growing in popularity. Check your area for shops that specialize in selling gourmet coffee beans, because they often host cupping events. Learning how to become a coffee connoisseur will not only be a delicious adventure, but it can also be a way to find other coffee lovers who share your passion. You’re driving around town and you’re craving your favorite specialty coffee drink, but each time that drink ends up costing you anywhere between $3 and $5. What if you learned to make your specialty coffee drink at home? We’re here to help. Check out these three specialty coffee drinks you can make yourself with Global Benefit Coffee. 1.Combine the hot milk, sugar, vanilla extract, and pumpkin pie spice in a blender; blend until frothy. 2.Pour the mixture into 3 coffee mugs to about 2/3 full. 3.Pour 2 oz coffee into each mug. 4.Garnish each mug with whipped topping and pumpkin pie spice. 1.In a suitably sized saucepan, mix together the cocoa powder and sugar. 2.Add the hot water and whisk lightly until smooth. 3.Heat gently for 2 minutes until the mixture turns think, stirring constantly. 4.Add the evaporated milk and the coffee. 5.Heat to just boiling, beat, then serve as desired. 1.Heat milk in a saucepan set over medium-low heat. 2.Whisk briskly to create a foam. 3.Brew coffee and pour into 4 cups. 4.Pour in milk, holding back the foam with a spoon. 5.Spoon foam over the top. The Freedom Café at UNH is a non-profit café that raises awareness and money to rescue victims of and end human trafficking by serving quality coffees and teas. The café is a creative space where individuals can be educated about human trafficking and ways to help eradicate this worldwide injustice. All of the proceeds from the Freedom Café are donated to non-profit organizations working with this issue. Each cup of coffee or tea is given for free. However, they do suggest donations based on fair market value. Fifty cents from each donation will go towards purchasing conscientiously traded and produced coffee and tea. Every cent over that amount will go towards an organization that is working to fight human trafficking world-wide through diverse strategies, such as raising awareness, policy making, and assisting former slaves. The Freedom Café at UNH is a part of the Freedom Café Network (freedomcafenetwork.org). Their goal is to not only be successful in Durham, NH, but to have the model of the Freedom Café spread to every local community with a passion for educating people about human trafficking and helping to end this injustice. They are passionate about good coffee and good tea. The Freedom Café is committed to sourcing their products from local companies that can provide them with quality (organic/locally sourced) and conscientiously traded (Fair Trade or direct traded) products. The café officially opened February 6th of this year and is open Monday through Friday from 11am-4pm. They are located at 10 Mill Road, Durham, NH and is just a short walk from downtown Durham and the UNH campus. On Wednesday nights from 7pm to 9pm, they have their Perform for Freedom Nights. This is a great venue for students and locals to perform. One hour of scheduled 20 minute performances, a second hour of open mic. Your favorite coffee and tea products are always served on these nights. Along with these Perform for Freedom Nights, they provide local artists an opportunity to get involved. The Freedom Café will hosts art openings and galleries with art on consignment. Part of the artist’s proceeds will go toward the cause of ending human trafficking. They also provide a seminar series on human trafficking and the issues surrounding it. We are excited about what the future holds for our partnership and look forward to working with the Freedom Café at UNH for years to come. Visit us at http://www.globalbenefit.org. Before you start your roasting session, you should know what type of coffee you want to roast. You should get out your log sheet, which is a written catalog you will keep that shows details about previous roasting sessions and the times, temperatures, and amounts you roasted. You’ll also want to have a recipe sheet showing which beans will be used for your blends and the weights for each. Next, you will turn on your roasting machine to let it warm up to approximately 400 degrees for the first type of bean you are going to roast. While the machine is warming up, you will weigh out your beans for each batch. If you plan on making a blend, you will not be roasting the blend all in one batch. Instead, you will roast each of the coffees individually that are to be used in that blend (each type of bean is roasted to its own unique style). Only after all of the beans have been roasted will you be ready to blend the coffee. Then you will want to pour the beans into the hopper, which is the funnel on the top of the roaster. When you are ready with your stopwatch and the temperature is perfect, you will open the chute and let the beans flow by gravity into the drum, which is already turning. As the coffee gets roasted, the sugars and carbohydrates get caramelized, which create that oily look you see on finished beans. This is what gives coffee that great flavor and aroma. The longer you roast the beans, the darker they will get. But before they start to take on the look of finished coffee, they will go through a series of changes. In the first three minutes of roasting, the beans will give off a grassy fragrance. Then they will begin to swell up and change from green to yellow to gold. By the 9-minute mark, the beans will have begun to wrinkle. Once you have determined the perfect roast for your coffee, you will open the door to the drum and the beans will spill out onto the round collection table, which is part of the roaster. This table has a perforated screen on the bottom to let air pass through and a series of rakes that turn to spread the beans, allowing them to cool as quickly as possible. This cooling will stop the cooking process. The collection table can also be used to blend the beans. After roasting, weigh out your beans according to your blend recipe and add them to the mixing table. The rake will do a good job of evenly mixing the different beans together. After mixing, your blend is ready to go. Every Global Benefit Coffee blend is made through a micro-roasting process. This allows for the beans to be made in smaller batches to roast the freshest beans possible, rather than making large batches and have them sit around for longer periods of time. Enjoy a cup of Global Benefit Coffee today. Visit us at http://www.globalbenefit.org.